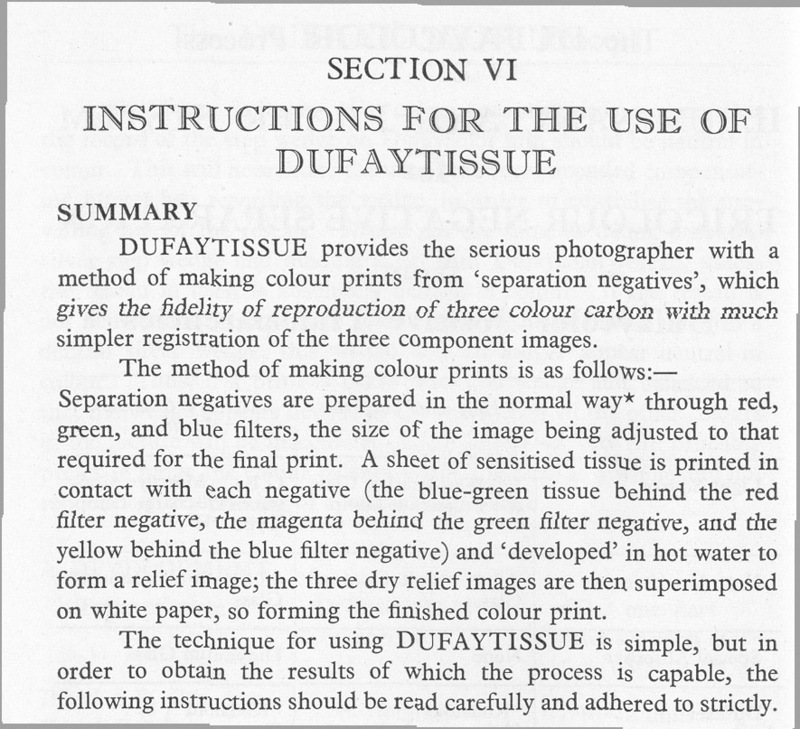 Louis Dufay produced photographic plates with a micro-colour-screen between 1910 and 1917. 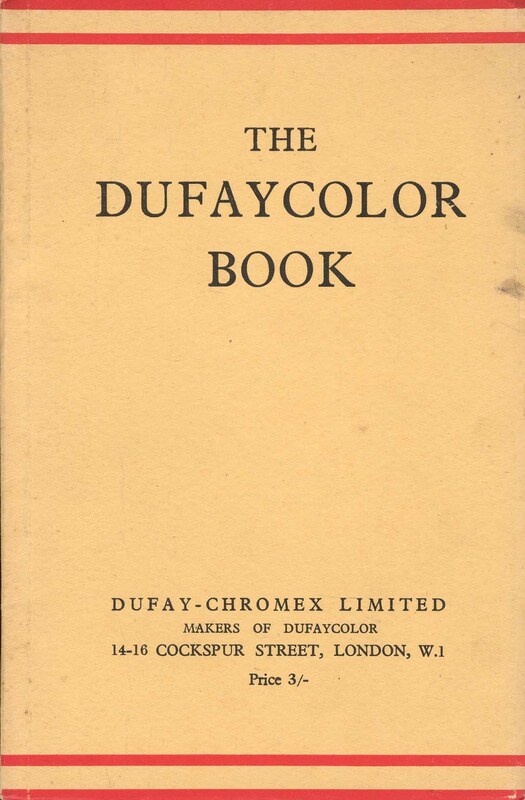 They were known as the Dufay 'Dioptrechrome Plate'. From 1925 a large number of patents were granted for various aspects of the Spicer-Dufay Process. 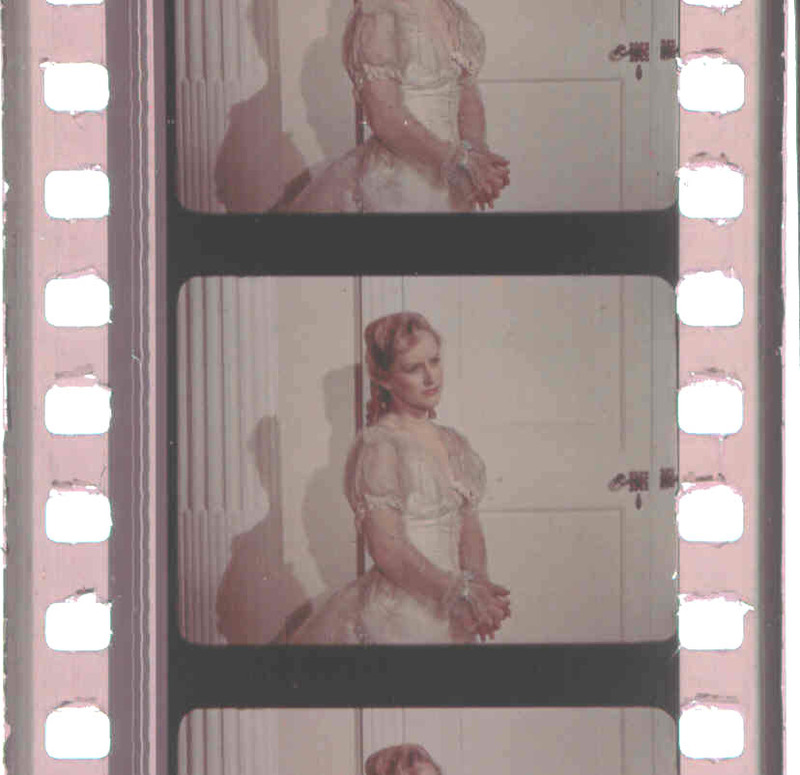 The films have the reseau mechanically printed on the base of the film. The film has to be exposed through the base. 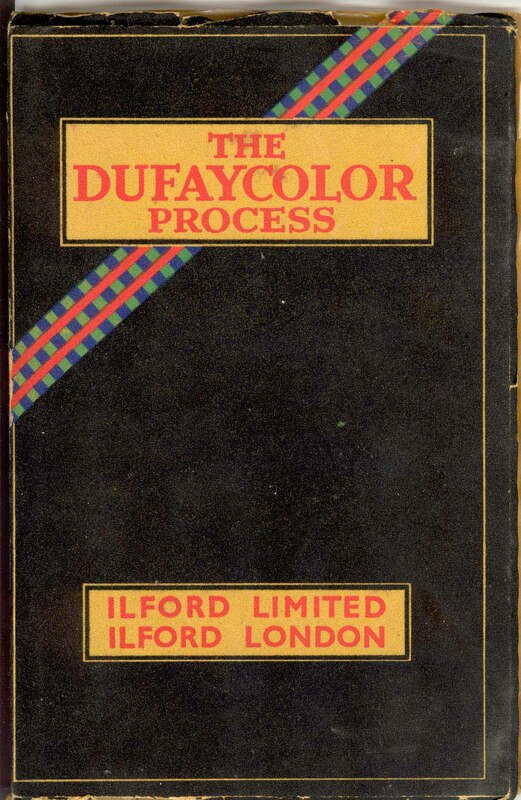 The method of printing the reseau on the film base can be seen in the illustration from the Dufaycolor Book above. First films were B/W reversal. 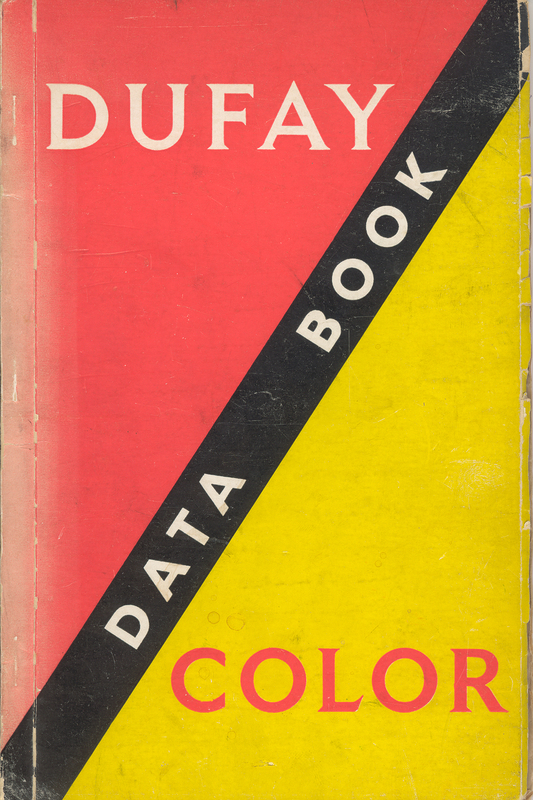 The invention by Dr D A Spencer of Kodak Ltd in 1936 of the 'depth developer' made the negative/positive process possible. 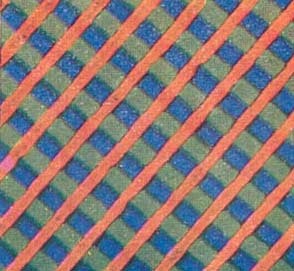 This restricted the development to the layer of emulsion next to the reseau on the base. 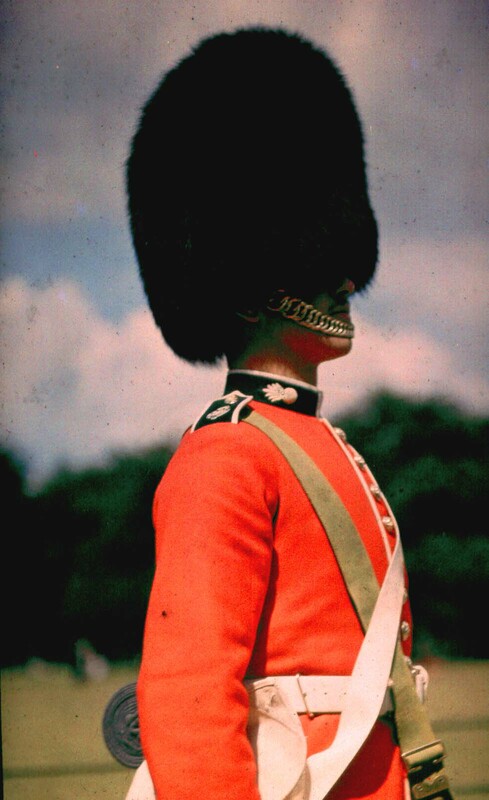 This prevented spread of the image which caused desaturation of the colours. 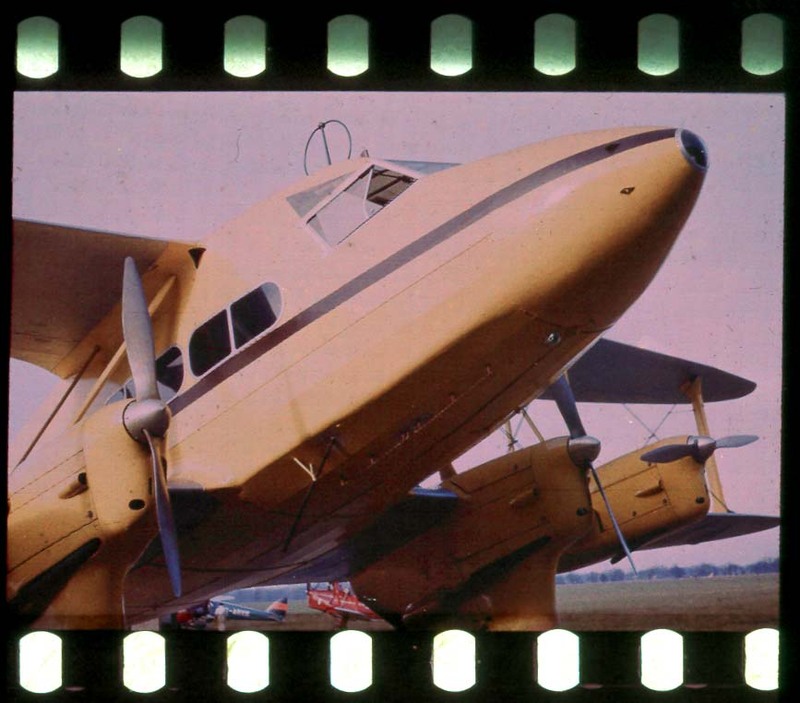 These pictures come from slides made by Jack Coote for his lectures to photographic clubs etc. Also the first page of his lecture notes. They were rescued from a rubbish dump by Charles Fairall Video Preservation and Engineering Manager at the NFTVA, Berkhamsted. 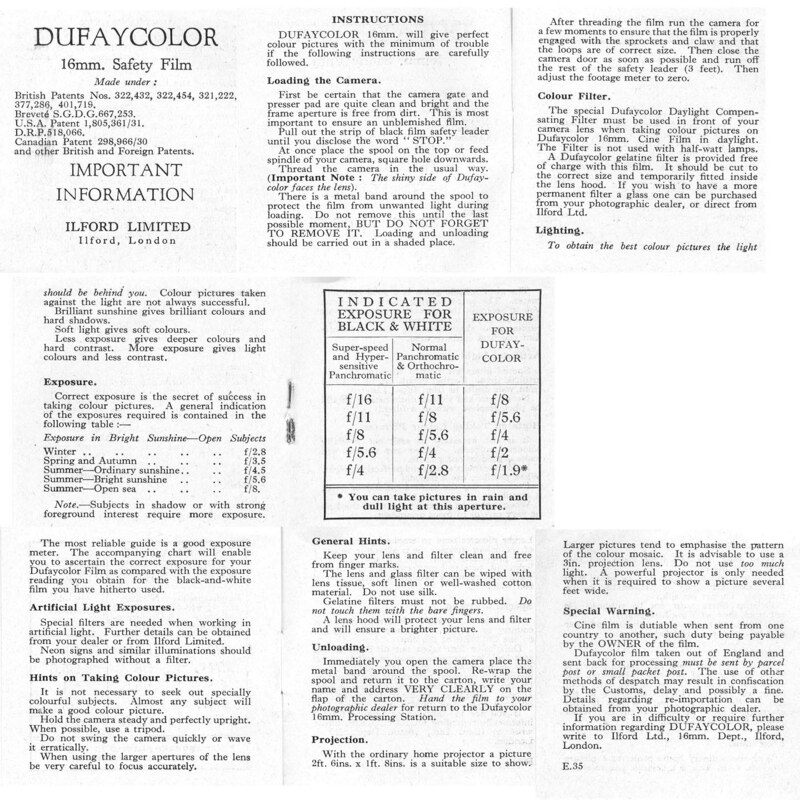 1933 Name change to Dufaycolor Ltd.
1934 Ilford Ltd acquire the British Empire rights.16mm film on the market for amateurs. 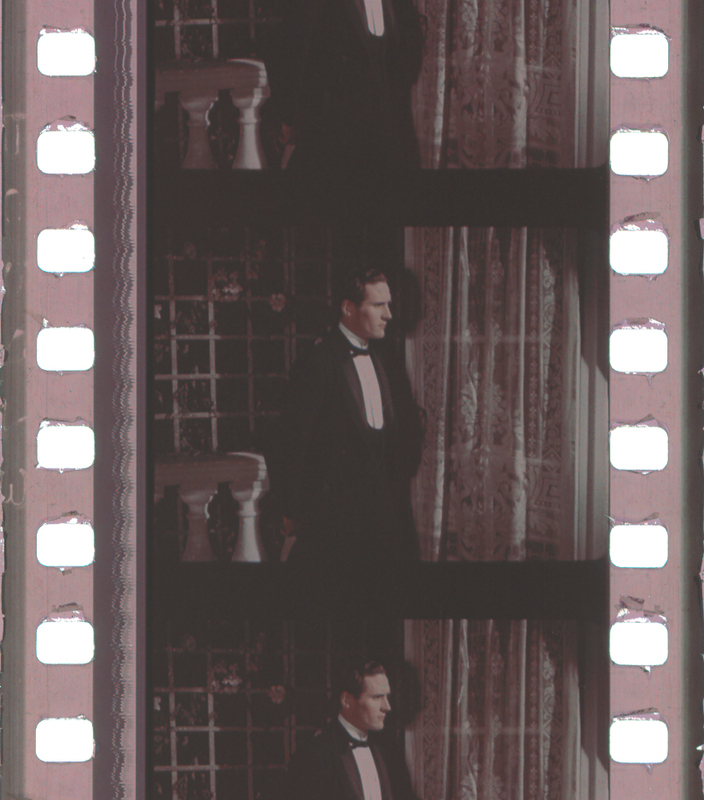 Sequence in 'Radio Parade' shot (see frames below) Claude Friese-Green was the cameraman. Shot on reversal with reversal prints. 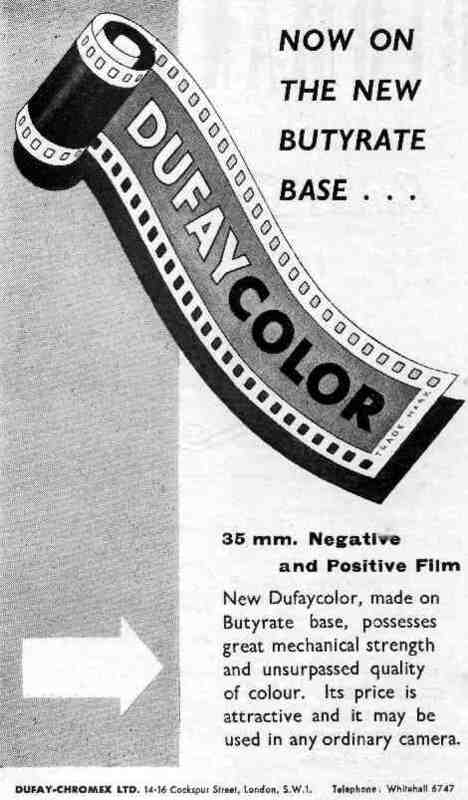 1937 Dufay-Chromex Ltd formed from the interests of Spicers, Ilford and Cinecolor Process (not the American Cinecolor). Processing Laboratory established in Thames Ditton. special printing machines were made by Vinten, Lawley and Debrie. These are three Dufay publications. I have PDF files available for purchase. A private company sponsored the development of the patents of Jack Coote. 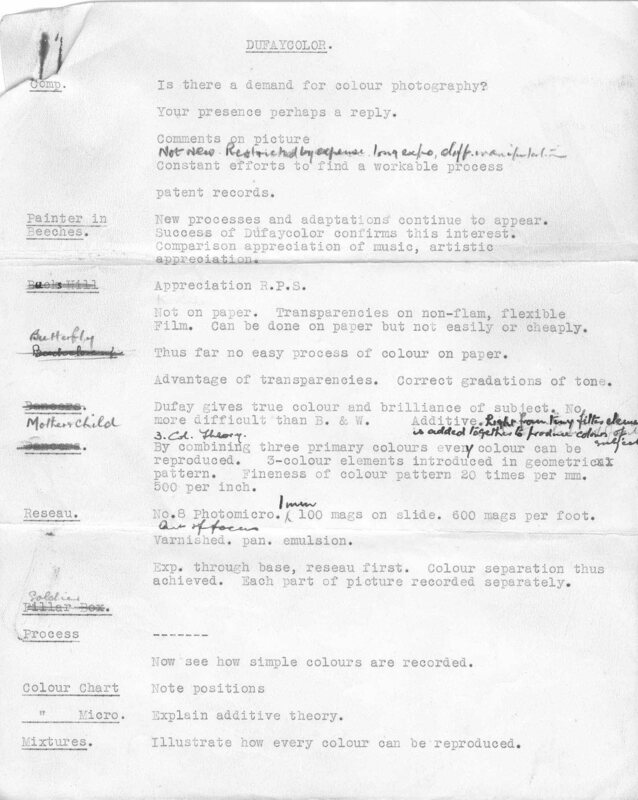 See JSMPTE June 1948 for a description of Jack's beam-splitter camera, similar to the Technicolor camera. 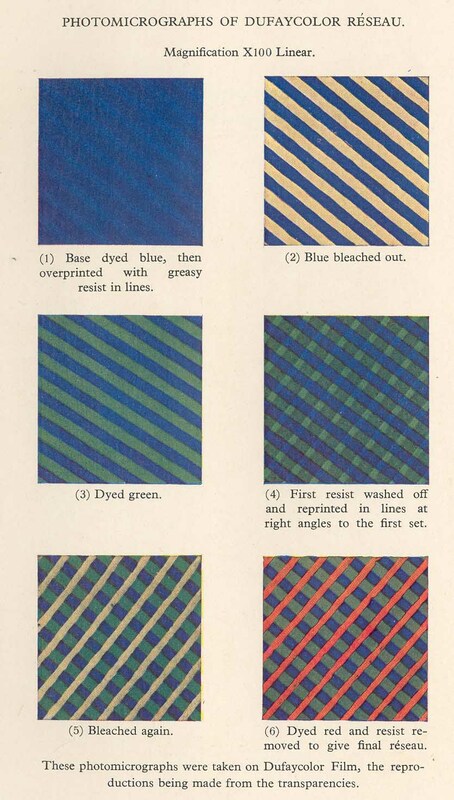 The print process used a two layer emulsion containing non-diffusing colour couplers and subsequently re-sensitised for the third colour. 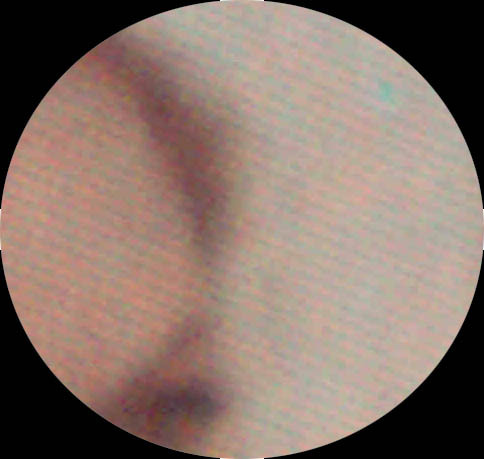 The blue record negative is printed onto a positive (non-colour sensitized) emulsion layer containing an immobile yellow colour former. 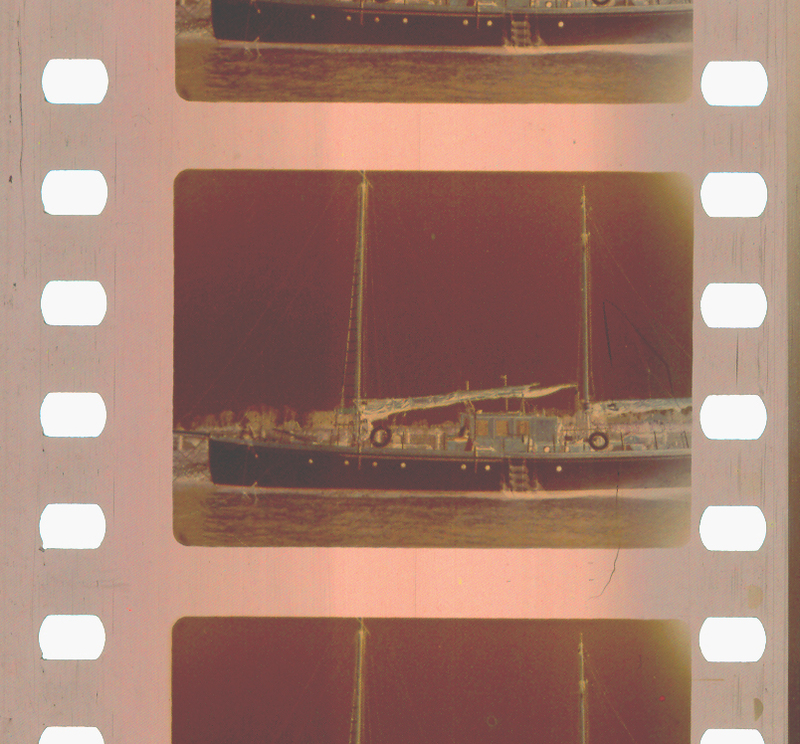 The latent image formed by the first printing operation is not immediately developed, but, instead, the film is re-sensitized with positive emulsion - this time containing an immobile magenta coupler.... the film is again sensitized with a positive emulsion - this time containing an immobile cyan coupler.